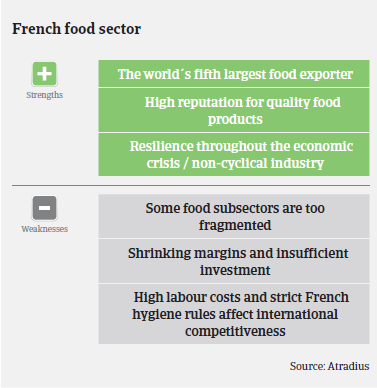 The French food industry has benefited from falling raw material prices and a weaker euro, which helped boost competitiveness abroad. According to the National Association of Food Industries (ANIA), turnover of the French agri-food industry decreased 1.8% in 2014, to EUR 157.6 billion, while production declined 0.5% in volume and 1% in value. 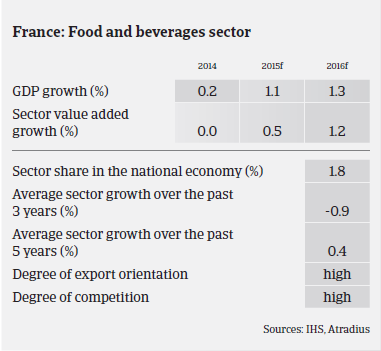 The sluggish French economic performance still hinders a robust rebound in consumer spending, therefore negatively affecting margins of industrial food manufacturers. While commodity price decreases in 2014 and H1 of 2015 (e.g. for wheat, milk and vegetables) have helped food producers to temporarily rebuild margins, this effect was mitigated by the fierce price competition in the French retail segment and contractual price-adjustment mechanisms. The on-going concentration process of retail chains has further weakened the bargaining power of food producers and processors, who are at the same time in competition with other European food businesses which in some cases have lower production costs. Still, the French agri-food industry is struggling with rising production costs, while gross margins have decreased for several years. This limits investments by businesses, that could increase their international competitiveness. According to the French Ministry of Food and Agriculture (AGRESTE), food production (including beverages) rebounded 1% in Q2 of 2015. The industry has benefited from falling raw material prices and a weaker euro, which helped boost competitiveness abroad. In H1 of 2015 the food trade balance remained positive. Payments in the French food industry can be overdue up to 15 days. A slight increase of non-payment notifications cannot be ruled out in the coming months, as some food businesses may face little support from their banks. Generally, French food businesses are highly dependent on bank finance, and many companies have high short-term debts to finance their working capital requirements. In H1 of 2015 food business insolvencies rose 0.9%, mainly due to an increase in the bakery segment. Without the increase in this segment, the food insolvency rate would have improved. In Q3 of 2015 food insolvencies decreased slightly, by 0.8%. This is in contrast to the overall French business insolvency development, where insolvencies are expected to increase 4% in 2015. However, due to some problems in the dairy and meat subsector, an insolvency increase in the coming six months cannot be ruled out. Dairy products form the second largest food industry subsector, accounting for 17% of total food sales. International milk powder and butter prices have already fallen for several months, and this downward trend has accelerated in 2015 due to fewer Chinese imports and the Russian import ban which is still effective. While lower prices have been beneficial for cheese manufacturers, exports of milk powder have been severely impacted. Some main players have invested large amounts in expanding their production capacities before demand from China decreased. If this subdued demand situation persists, it could lead to cash flow and debt repayment issues for some of those businesses. With a 20% share of sales and with 26% of food sector employees, meat is the largest food subsector. The French meat industry is composed mainly of small companies, and even French groups are quite small compared to their foreign competitors. According to AGRESTE, following a 1% increase in Q1, meat production decreased 2.0% in Q2 of 2015; mainly due to decreasing prices. Increased pressure on meat prices, especially pork, even led to tense situations and conflicts with producers in Brittany. Fruit and vegetable prices decreased due to pressure on sales prices, a drop in consumption last summer, and the impact of the Russian embargo. According to AGRESTE, production of processed fruits increased 2.7% in Q2 of 2015 after a 4.1% increase in Q1. The beverage industry represents 16% of total food sales, and exports about 30% of its sales. Production increased 3.5% in 2014 (excluding wine production). In Q1 and Q2 of 2015 production increased an additional 1.7% and 3.7% respectively, supported by a mild spring. The trade balance remained positive and is still improving, thanks to increasing exports of wine and champagne. 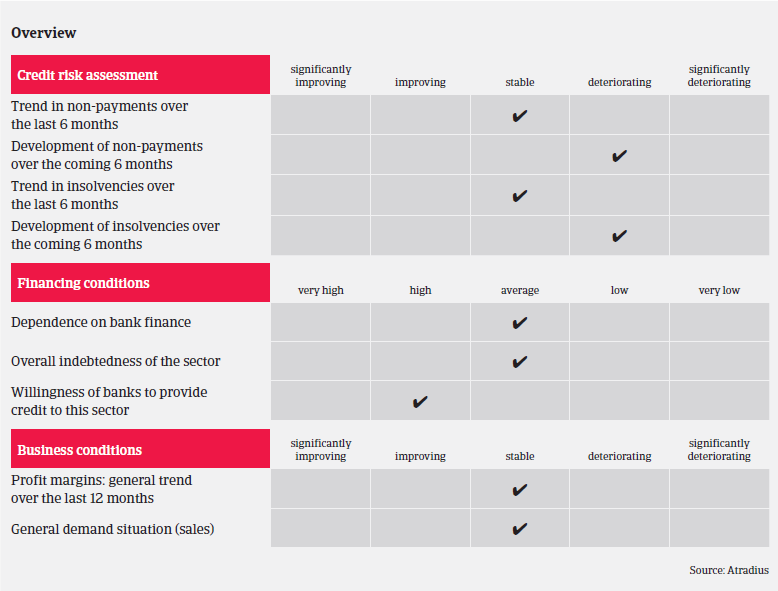 While our underwriting stance towards this sector remains generally relaxed, we are keeping a closer eye on certain subsectors, especially meat and dairy, because of their challenging market conditions. We try to meet our customers’ requests whenever possible and, indeed, where our assessment of the buyer or subsector is particularly positive, we encourage the customer to extend credit limits further. De Franse economie zal in 2015 naar verwachting met 1,1 % groeien, door een toename in de consumptie, productie en export. Deze blijft echter wel onder het voorspelde eurozone-gemiddelde van 1,4%. Net als in 2014 zien de vooruitzichten voor de Franse ICT-sector er redelijk gunstig uit voor 2015; de omzet zou met 2% moeten groeien.